Make the NRRPT your home page by clicking here. To Pay Dues Online: Click on Members Section, then Members Profile (at this point you must log-on with an Email Address and Password), click My Information and go to the bottom of your membership page to pay dues. The log-in link is at the bottom of the home page. Log in using your registered email address and your password. Your default password is your zipcode and registration year together (example: 123452002). Once you've logged in, the easiest way to get to your information is to go to the "Membership Information" link on the left menu, click on "Members" and click on "My Information". If you still can't get in, just send an email message to the . The 2019 Handbook can be viewed by clicking here. For more information about maintaining or regaining NRRPT Practitioner status - click here. NRRPT Members: The NRC is seeking input from licensees, Agreement States, and the public to inform the staff’s assessment of potential revisions to regulations or processes requiring Category 3 source protection and accountability. As part of this effort, the NRC has published a Federal Register Notice (here) with question for the public to respond to as well as dates for public meetings on this issue. Letter to the NRRPT Office is here. Click here for exam dates and deadlines. If you would like to submit an article for the newsletter, email or click here and then click on "My Articles" to create one online. This book was donated to the NRRPT by David Waite and James Mayberry in June 2002. It is an excellent book that can be used as an examination preparation guide or reference guide for your office. The objective of this book is to guide the reader toward a mastery of working radiation protection problems at the technologist level. It is now available by clicking here. 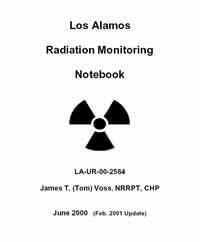 The latest version of the Los Alamos Radiation Monitoring Notebook is available in PDF format here. Any reference to reference/study material or training services does not constitute or imply an endorsement by the NRRPT of the reference/study material or training, or its producer or provider. The views and opinions expressed in any referenced document or training do not necessarily state or reflect those of the NRRPT. Click here to see a list of the NRRPT Scholarship Recipients.